Mike Cannon, women’s soccer head coach, was named the GLVC Coach of The Year at the awards banquet, Nov. 1. In addition, senior Laura Ney and sophomore Hanna Burke were first team all-conference selections and juniors Maggie Beem and Hanna Liljegren were voted onto the second and third teams respectively. Huping Ling, professor of history, recently published “Asian American History and Cultures: An Encyclopedia.” With overview essays and more than 400 A-Z entries, this encyclopedia documents the history of Asians in America from earliest contact to the present day. Organized topically by group, with an in-depth overview essay on each group, the encyclopedia examines the myriad ethnic groups and histories that make up the Asian American population in the United States. “Asian American History and Culture” covers the political, social and cultural history of immigrants from East Asia, Southeast Asia, South Asia, the Pacific Islands and their descendants, as well as the social and cultural issues faced by Asian American communities, families and individuals in contemporary society. In addition to entries on various groups and cultures, the encyclopedia also includes articles on general topics such as parenting and child rearing, assimilation and acculturation, business, education and literature. 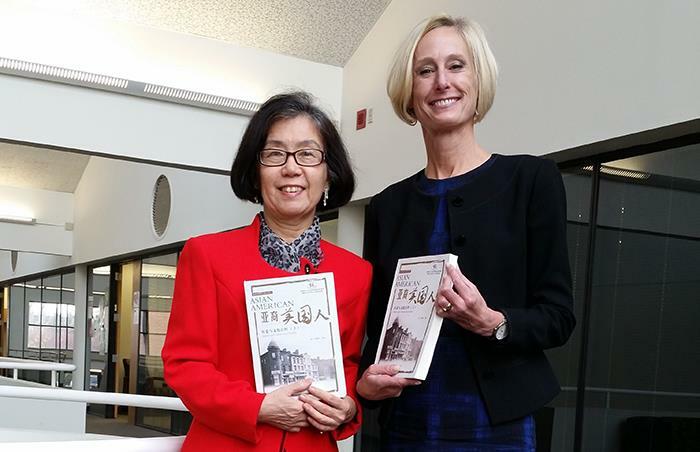 Huping Ling, left, presents a copy of her book to Janet Gooch, executive vice president for academic affairs and provost. Peter Windsor and Sarahi Vera presented research posters at the 10th Annual ATSU Interdisciplinary Biomedical Research Symposium, Oct. 27. Windsor, senior chemistry major, presented on the inhibitory capability of biflavanoid molecules on the aggregation of Amyloid Beta peptides, biomolecules associated with Alzheimer’s Disease, which is part of an ongoing collaboration with Dr. Henry Han at ATSU. Vera, senior chemistry major, presented her research on selective inhibitors for calpains, enzymes known to promote Alzheimer’s Disease in humans. Windsor and Vera both won awards for their outstanding research presentations. The awards came with a certificate and monetary compensation. Bill Miller III, assistant professor of chemistry, served as their research supervisor and accompanied them at the conference. These students will be continuing their research projects during the academic year in the Miller Research Lab. 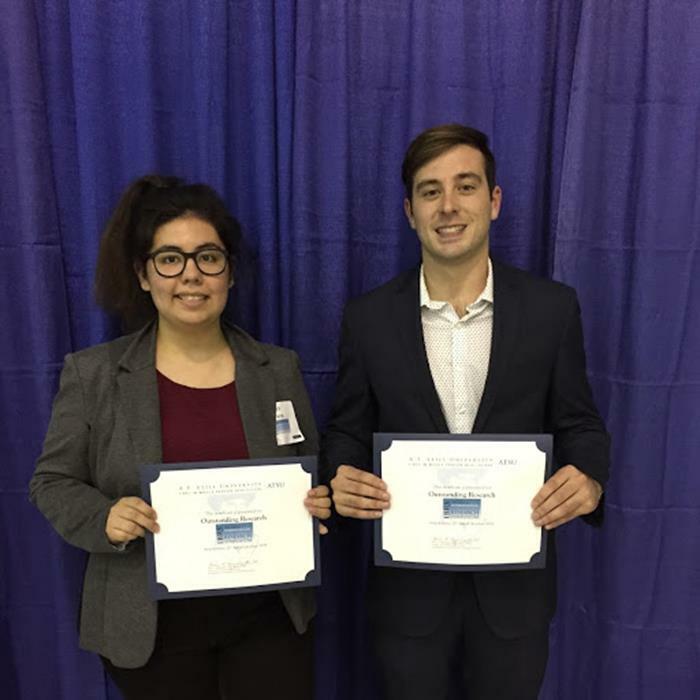 Sarahi Vera, left, and Peter Windsor received awards for their outstanding research presentations.